This project was somewhat of a legacy process; the entire ninth grade was assigned the honor of designing the future campus of AHS. Not only had that meant that generations of ospreys are going to attend something the class of 2020 created, but it also urged us to use our diverse and creative mindsets to the fullest of their potential. During this project I learned how the human mind works during the design process. I've figured out that in order to have a functioning group create beautiful everyone needs to give space for mistakes and new ideas. I've always known that humans are capable of designing functional systems while remaining creative and interesting. But now since I've been a part of the process I have a new perspective of just how important detail is while working on such a project. 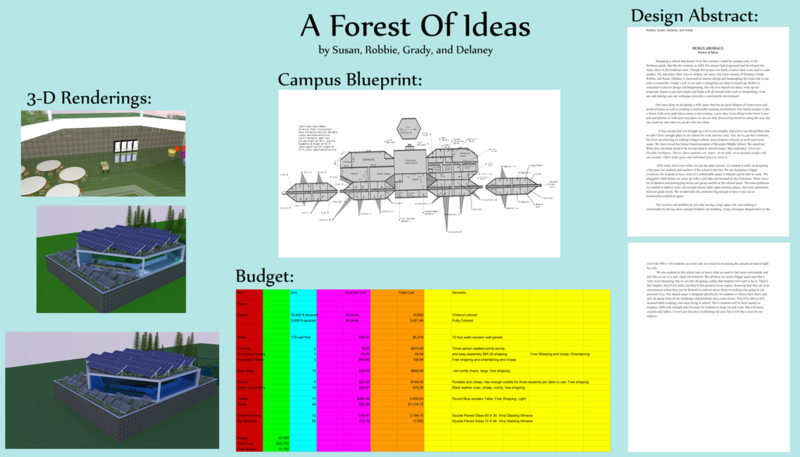 For example, we had to create a budget for a shared space on campus down to the carpeting. Its easy to forget how important the little things are. We were all paired up in groups of four and were given a series of tasks to complete together, and we worked with our groups for the entirety of the project. My group especially struggled with advocating our ideas clearly, and because our group lacked a driver and consisted of two analyticals and two expressives our groups was little unbalanced, which was difficult to persevere through. If I could redo this project, I would definitely allow my quieter peers a chance to advocate for themselves more than drowning their voices out. For example, one of my members had attached themselves to an idea that we were constantly getting critiqued on. Instead of allowing them to build on that idea, my other expressive member and I made them just drop the idea all together. Its very important for students to have a say in their learning environment. I know that, yes, the current Animas community is functional, but I know now that since we're taking the learner's opinion the future campus will provide one of the best and innovative spaces for learning and its opportunities.